Noam is unhappy and starts crying. He stretches out his little finger and shouts: "That!..." Daddy hurries to him, and tries to understand what he wants. He tries giving him a ball, a white teddy, a rubber snake, and lots of other things. But nothing works. Daddy is very frustrated. Why can`t he find what his son wants? What could the "that" be that Noam wants? Desperate to calm Noam, Daddy picks him up and holds him in his arms, and suddenly, lo and behold, the crying stops! Noam finally got the "that" he wanted - his daddy! 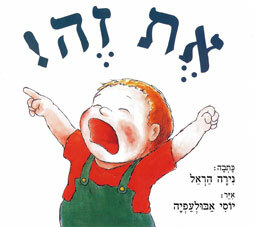 Book title - Hebrew (phonetic) Et Zeh!